The Mobile Lorm Glove enables deafblind persons to communicate and connect with others using mobile technology. The glove uses “Lorm,” a tactile signing language used by people with both a sight and hearing impairment. The bottom-side of the glove contains pressure sensors that translate “Lorm” into visual or audible forms of communication (text messages or speech) via a mobile phone. 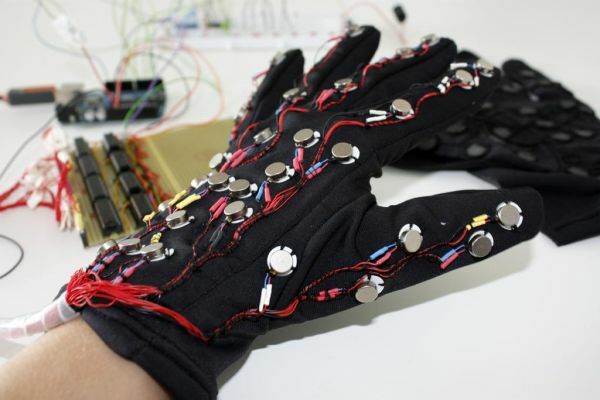 The glove also allows the user to receive messages via tactile feedback patterns. In addition to the pressure sensors, the glove contains several vibration motors on the back that translate messages into vibrations. It is possible to imagine users beginning able “feel” entire audiobooks. The project was developed at the Design Research Lab by Tom Bieling, Ulrike Gollner and Gesche Joost. The next phase of research will include direct speech input and output. Design research projects like the Mobile Lorm Glove hint at the undiscovered opportunities and the capacity for wearable technology to fundamentally change peoples lives. This assistive technology empowers deafblind people with the confidence, ability, and means of communication to engage with the world.